This story from China is a good illustration of the venerable mantra "If something can go wrong, it will." 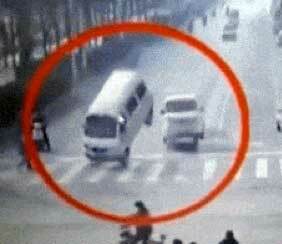 On the other hand, this makes China one of the first countries to invent levitating cars! A Chinese phone company crew was installing a telephone pole which, when set, would have a wire that crossed a major street. During the installation process, the crew left the wire on the ground on the side of the street where the pole was being installed. The other end was already attached to a pole on the other side of the road. The installation crew figured cars would simply drive over the flat cable. That's when the street sweeper went by... The sweeper operator, not seeing the nearly invisible steel cable that was on the road, ran over it with the sweeper's gutter broom in full rotation. The cable, as is shown in the photo to the left, snarled around the gutter broom mechanism. Since the other end of the cable was attached to the pole on the left of the video the cable was brought taut and, before you know it, the cars that ran into the cable were flung into the air. When you watch the video, it's helpful to know that the cable on the right side of the frame is actually across the hood of the car on the right, not underneath. That's why the back of the car came up as the cable pressed down on the front/hood. 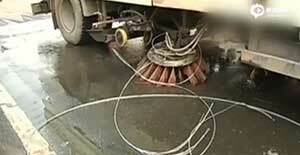 The van, however, caught the cable in the front and so was lifted off the ground front wheels first. Now that you know the details, take a look at the entire video someone shot of the incident. If you cannot view the embedded video below, use this link.